I am laughing while writing about this week’s Throwback Thursday recipe. Don’t get me wrong, the dish was delicious, I just had a few mishaps while trying to prepare it. This meal was my first time eating butternut squash. I spent ages trying to find a recipe that I thought would be a good intro for the new veggie. Finally, I decided to make gnocchi, something else that I had never made before. I ended up making the gnocchi way too wet and struggled to make well-shaped pasta. At the time I had no idea that the pasta was too wet and was dumbfounded on how people made their gnocchi have the cute little fork marks in them. To this day I have still not made gnocchi again. It is something I should probably think about doing in the near future. Even with my gnocchi failure, the pasta turned out edible and the sauce made the dish delicious. The sauce is a delicious combination of lamb, tomato and zucchini with a Moroccan spice blend that includes garlic, cumin, paprika, chile powder, cinnamon, allspice and cayenne pepper. This sauce would go great with any type of pasta, so don’t worry if you are intimidated by homemade gnocchi as well! Preheat the oven to 400F. Cut the top and bottom off of the squash, halve lengthwise, and remove seeds. Put the halves, cut side down, on a baking sheet and bake until the squash is tender (about 1 hour). Bring a large pot of water to boil and prepare a bowl of ice water. Scoop 1 tbsp of the squash mixture into an oval and drop into boiling water. Make multiple gnocchi and cook for 5 minutes, then place in the ice water. Repeat with remaining batter, let cool, then pat dry. For the sauce, heat the oil in a large saucepan and cook the onion and garlic over medium heat until soft (about 5 minutes). Add the lamb and cook until changed in color (about 3-5 minutes). Add spices and stir until fragrant. 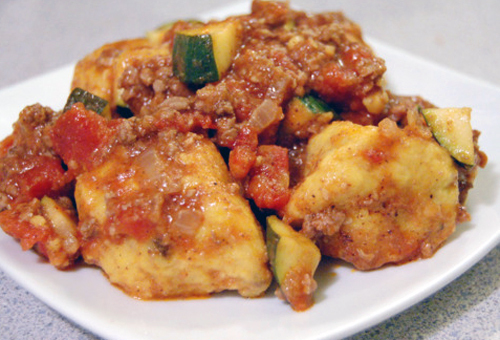 Stir in the tomato paste, undrained tomatoes and zucchini, then bring to a boil. Reduce the heat and simmer uncovered until sauce thickens slightly (about 15 minutes). Salt to taste. Reheat gnocchi and serve with a about ½ cup of sauce per plate. I’m still looking for things to do with butternut squash, and this is definitely something that sounds challenging–bit different from my usual kitchen experiments! That lamb sauce sounds great! I would be very intimidated by making gnocchi from scratch. The sauce sounds so perfect. Even spooning it from the pot would be a joy! What a great intro to butternut squash! This sounds good to me! Butternut squash is both delicious and versatile. I love the lamb sauce with a big helping of several spices. Buzzed it! I’ve never made gnocchi myself. It seems very time consuming! You’re very brave for trying. I guess what’s nice about a gnocchi recipe is that even if it “flops”, the gnocchi will still taste so yummy…like dumplings boiled in stew. Delish! This sounds delicious to me, but I never made gnocchi too.